While many of your friends and relatives will be hitting the shopping malls on the Friday after Thanksgiving, you should know that racing will be in full swing with many tracks open coast to coast. From Thanksgiving Day till Sunday you can find large and small stakes races on almost every circuit, as well as competitive allowance and maiden special weight events. Be sure to check out the full menu of wagering opportunities by using the Winning Ponies tote board so you don’t miss out on the action. One of the more competitive races to shape up over the holiday weekend is the Grade 2 Go for Wand Handicap at Aqueduct on Friday, November 25th. This race is a one-turn mile on the main track for fillies and mares 3-years-old and up. The morning-line favorite Arena Elvira will be looking to extend her 4 race (all stakes) win streak since she’s exited the allowance ranks. The Go for Wand Handicap will be run as the 9th race on a 10 race card. Didn’t manage to get the job done last time out as the favorite in the seven-furlong Friendly Island Iroquois against NY state-breads at Belmont Park on Oct 22 and is now taking a big step up in class to face open company. While her best distance is at six-furlongs if Lovely Lil can get a clean break from the one hole she could be dangerous on the front end without looking back. 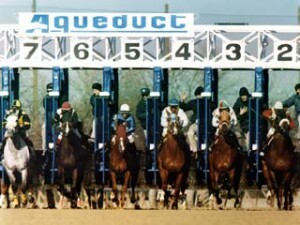 Over the past week 17% of one mile races at Aqueduct have been won from the rail post position or by a horse going wire to wire. Was able to beat Lovely Lil after a tough duel at the top of the stretch in the Friendly Island Iroquois at Belmont and looks to be in great form coming off a sharp 5 furlong workout on Nov 18 in 1:003. As a four-year-old who has run 80% of her races at six furlongs is looking to stretch out and last month’s win at seven furlongs seems to be the proof that Risky Rachel can handle more. Back in the hands of everyone’s favorite banned yet still active trainer Rick Dutrow after switching hands 3 times in her last three races. All Due Respect is getting plenty of respect from the crew at NYRA appearing as the 3-1 morning line 2nd choice and second high-weight carrying an impost of 118 pounds. But should any horse coming off of a six month layoff, even if they have the most back class of the field? While this horse could certainly handle this group with ease in her best of days – we would have liked to see prep in an easier spot for a comeback race. All Due Respect has hit the board in 5 graded stakes appearances with a lifetime record of 15-4-4-4. She is also a proven winner at a mile over the main track at Gulfstream and Santa Anita. This classy 4-year-old daughter of Tiznow is coming back to graded stakes company for the first time in 2011 after having a great season going 5-2-0-2 so far this year in overnight stakes and pricy optional claiming events. Katy Now’s last race at Belmont was a nice showing winning at one mile after running though honest early fractions of 22.3 and 45.3. Jockey Corey Nakatani is going through a cold spell and has only won on 3% of his mounts (34-1-3-7) for the meet at Aqueduct this race meet. A nice sprinter in the allowance ranks at Parx, but seems to be out of her comfort zone in this race. Indian Legend looks to be fairly one dimensional and a win here would be truly unexpected. Seeking her fourth consecutive stakes win, this 4-year-old daughter of Ghostzapper will be carrying the top weight of 120 pounds. Her last three races were contested at 1 1/8 miles over two turns – so her connections are looking to cut her back in what will likely be her last start of the season. Her last win in the Turnback the Alarm over this same track only 3 weeks ago was impressive when she romped home by over 6 lengths over her rivals. Arena Elvira has never finished out of the money in 11 lifetime starts so don’t leave her out of any exotics. Look out for a minus pool on this one in the show betting as well. The morning line price of 5-2 to win is fair if you can get it at post time. Last win was all the way back in April, but that was over a muddy surface going a mile on the main track at Aqueduct. So if it rains look you may want to leave Spa City Princess on your ticket. However, if the track is fast you would be well advised to ignore. Has shown some versatility in her running style over her last few appearances changing from a need the lead type to more of a stalker or off the pace horse. The only problem is that she seems to be less effective off the pace and really does need to be on the front end all the way to win. Most of her starts have been on the turf but she hasn’t shied away from the main track when the grass gets rained out. Persuading doesn’t look likely to make an impact in this race. Switches to the barn or Rick Dutrow, who is leading the trainer standings at Aqueduct so far this race meet. Her last outing at Belmont was a successful one where he covered seven furlongs to win an overnight stake at odds of 13-1. While C C’s Pal won’t be as long of a price here, she may very well find her way to filling out the bottom of the exotics.